Updated Monday September 10, 2018 by West Hill Baseball League. 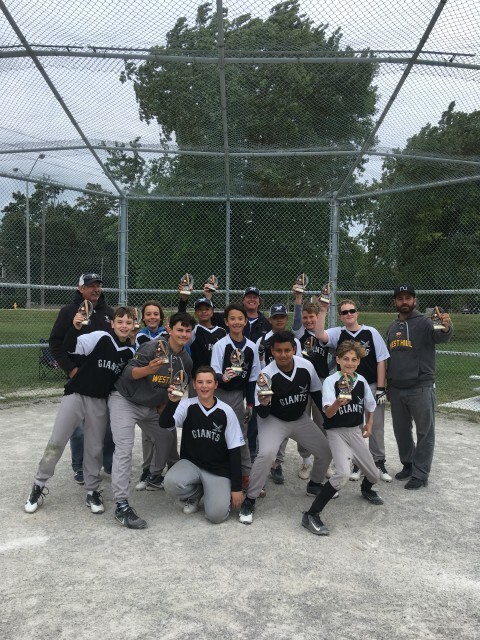 Our West Hill Peewee team, represented by the Giants won the SBA Championship edging out Wexford-Agincourt in 8 innings. Down 8-1 early in the game, the Giants fought back, heading into the 7th inning down by only three runs. They tied the game and sent it into extra innings. Wexford scored a run in the top of the 8th, but the Giants walked it off in the bottom of the inning. Congratulations to the Giants players and coaches! Our Mosquito and Rookie teams also represented us well in the SBA Playdowns, both of them coming in second in the tournament. Congratulations to our Mosquito Blue Jays and Rookie Pirates!